Remedy recently filed a trademark for something called ‘Alan Wake’s Return’, but it turns out it wasn’t for an Alan Wake sequel after all. Instead of getting upset, why not see if you’ve played all the games in our picks of PC’s best horror games. Those should keep you going for a bit. He went on to say there’s “no real news about anything future Alan Wake-related,” but said that the team were “exploring possibilities and concepting different things, but lots needs to click into place for anything to happen. “We will be the first to talk about it when there is something definite to talk about,” he concluded. But the Wake train doesn’t stop there. 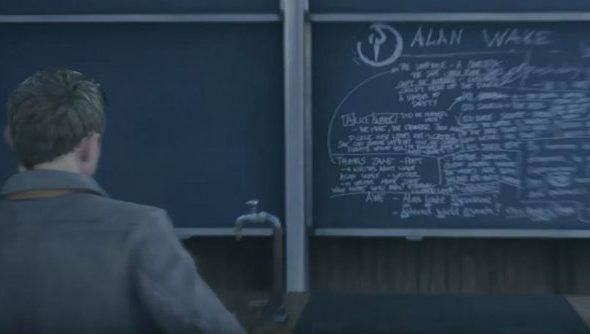 People have been uncovering Alan Wake Easter eggs in Quantum Break gameplay videos – scribblings on chalkboards, that sort of thing. It’s almost as if Remedy are trying to see how much of a buzz there still is around the cult horror game. The Daily Star had a chance to talk about the Easter eggs to Remedy’s communications director,Thomas Puha, who had the following to say: “Is there a higher purpose? Of course! We want to keep the name out there. But really, you should take it as a sign of things to come; it’s there, we had some fun, we got to get the band back together basically. It seems like the developers are keen, but they’re just looking for someone to back a return to Alan Wake. Perhaps Remedy are hoping that the buzz around these teases will prompt Microsoft to swoop in and greenlight a sequel. Would you like another Alan Wake? Let us know in the comments.